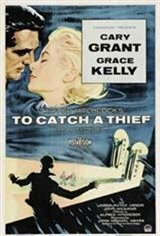 A jewel thief is at large on the Riviera, and all evidence points to retired cat burglar Cary Grant. Escaping the law, Grant heads to the Cote D'Azur, where he is greeted with hostility by his old partners in crime. All of them had been pardoned due to their courageous activities in the wartime Resistance, and all are in danger of arrest thanks to this new crime wave. But Grant pleads innocence, and vows to find out who's been copying his distinctive style. With the reluctant aid of detective John Williams, Grant launches his investigation by keeping tabs on the wealthiest vacationers on the Riviera. One such person is heavily bejeweled Jessie Royce Landis, who is as brash and outspoken as her daughter Grace Kelly is quiet and demure. But still waters run deep, as they say, and soon Kelly is amorously pursuing the far-from-resistant Grant. Part of Kelly's attraction to Grant is the possibility that he is the thief; the prospect of danger really turns this gal on. Being Cary Grant, of course, he can't possibly be guilty, which is proven in due time. But by film's end, it's obvious that Kelly has fallen hard for Grant, crook or no crook. Occasionally written off as a lesser Alfred Hitchcock film (did we really need that third-act fashion show? ), To Catch a Thief is actually as enjoyable and engaging now as it was 40 years ago. Though the Riviera location photography is pleasing, our favorite scene takes place in a Paramount Studios mockup of a luxury hotel suite, where Grant and Kelly make love while a fireworks display orgasmically erupts outside their window. And who could forget the scene where Jessie Royce Landis disdainfully stubs out a cigarette in an expensive plate of eggs? Adapted by frequent Hitchcock collaborator John Michael Hayes from a novel by David Dodge To Catch a Thief won an Academy Award for cinematographer Robert Burks.